Powering the next generation of smart connected objects like digital-home products, wearable electronics, smart lighting, and smart sensors, STMicroelectronics (NYSE: STM), a global semiconductor leader serving customers across the spectrum of electronics applications, has revealed an advanced dual-processor wireless chip that supports new features and enhanced performance with extended battery life to deliver an improved end-user experience. The new STM32WB wireless System-on-Chip (SoC) devices combine a fully-featured Arm® Cortex®-M4-based microcontroller to run the main application as well as an Arm Cortex-M0+ core to offload the main processor and offer real time operation on the Bluetooth Low Energy (BLE) 5 and IEEE 802.15.4 radio. The radio can also run other wireless protocols concurrently, including OpenThread, ZigBee®, or proprietary protocols, giving even more options for connecting devices to the Internet of Things (IoT). Today, only a few manufacturers offer similar dual-processor wireless chips capable of managing the user application and the radio separately for optimum performance, and with such large memory size. Alternatives typically utilize entry-level Arm Cortex-M industry-standard cores, which introduce architecture limitations. Combining the higher-performing Cortex-M4 with a Cortex-M0+ for network processing, the STM32WB leverages ST’s ultra-low-power MCU (microcontroller) technologies to combine superior RF performance for longer battery life. The SoC also includes essential circuitry (balun) for connecting to the antenna, which engineers must usually design themselves, as well as generous user and system memory, hardware encryption, and customer-key storage for brand and IP protection. Engineering samples of the STM32WB in packages up to 100-pin WLCSP will begin sampling to lead customers in Q1 2018, priced from $1.56 for high-volume orders. 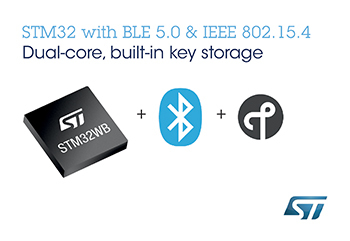 Further Technical Information:As an evolution of the well-known and market leading STM32L4 ultra-low-power MCU series, the STM32WB platform brings built-in wireless connectivity to ST’s STM32 family. The robust and low-power 2.4GHz radio consumes only 5.5mA in transmit mode, and as little as 3.8mA when receiving. 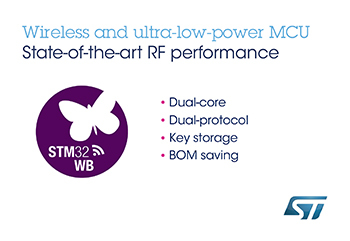 The STM32WB offers a comfortable RF link budget of -102dBm and is capable of +6dBm output power. The integrated balun, leveraging ST’s expertise in single-chip baluns, saves up to nine additional external components. The new devices leverage rich STM32 digital and analog peripherals that are engineered for extended battery life and complex functionalities, including timers, ultra-low-power comparators, 12/16-bit SAR ADC, a capacitive touch controller, LCD controller, and industry-standard connectivity including crystal-less USB 2.0 FS, I2C, SPI, SAI audio interface, and a Quad-SPI supporting execution in place. To assist development, the STM32WB platform is served by a dedicated connectivity tool, STM32CubeMonitor-RF (order code: STM32CubeMonRF), which simplifies radio testing. Users can also take advantage of the STM32CubeMX pinout/clock configurator and code generator, as well as peripheral drivers, middleware, code examples, and a dedicated STM32 Nucleo board to accelerate time to market. The STM32WB dual-core architecture enables real-time execution of both application code and network-processing tasks. As a result, developers can ensure an outstanding end-user experience while also taking advantage of the flexibility to optimize system resources, power consumption, and bill-of-materials (BOM) costs. The Cortex-M0+ network-processing controller contains certified protocol stacks including ST’s OpenThread stack and the Bluetooth 5 stack with Mesh 1.0 support, which comes with multiple profiles. The radio’s generic HCI and Media Access Control (MAC) layer gives developers the flexibility to use their own choice of Bluetooth Low Energy (BLE) stack, or other IEEE 802.15.4 proprietary stacks. State-of-the-art protection features -- essential to protect users’ data and help product vendors protect their intellectual property in all smart connected devices -- include embedded customer-key storage, an elliptic curve encryption engine for Public Key Authentication (PKA), and hardware support for AES 256-bit cryptography. Vendors can also future-proof products in the field, leveraging Secure Firmware Update (SFU) and support for Root Secure Service (RSS) to authenticate Over the Air (OTA) updates. STM32WB devices will be available in a choice of 48-pin UQFN, 68-pin VQFN, or 100-pin WLCSP with up to 72 general-purpose I/Os (GPIO). Each can be specified with any of three memory configurations, giving a choice of 256KB Flash and 128KB RAM, 512KB-Flash/256KB-RAM, or 1MB-Flash/256KB-RAM.